"He is our first child and we were thrilled at his arrival. We had so many dreams and plans for him but now all that is reduced to one thing - to save his life. Shivers ran down my spine when I heard his heart murmurs. His heart was beating rapidly. He was immediately taken to ICU and many tests were done. 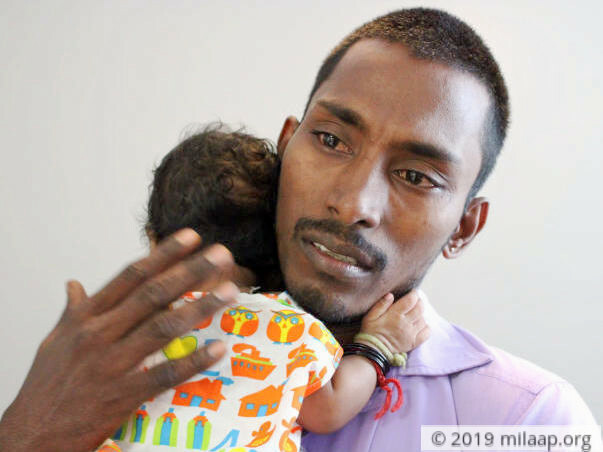 I hoped those murmurs would be normal' but doctors said he has heart disease and needs an urgent surgery" - Loganathan. The young couple is devasted to know that their precious baby's life is uncertain even before they could take him home. Srividya's baby Tejas is now 2-months-old. He should have got the surgery long back, but they couldn't make it happen because of financial constraints. They are scared that their only son will slip away from their hands at any moment. Srvidhya's pregnancy was smooth and her scan reports were perfect. 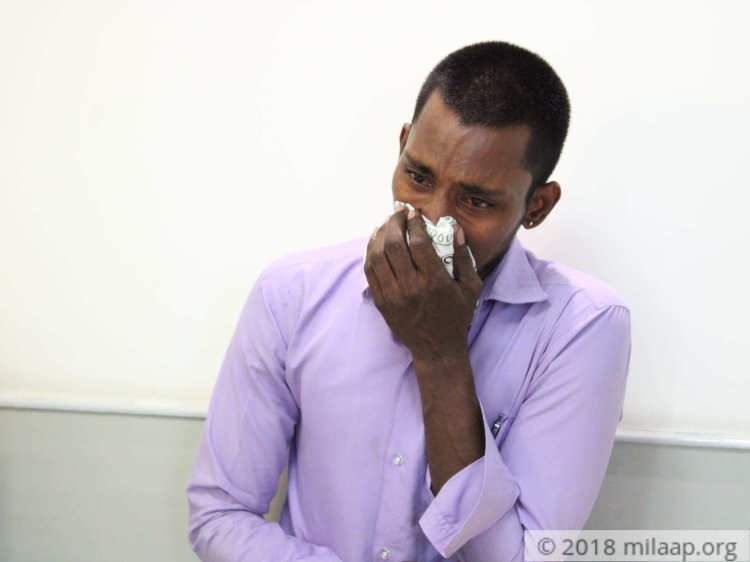 She and her husband Loganathan were least prepared for any bad news. 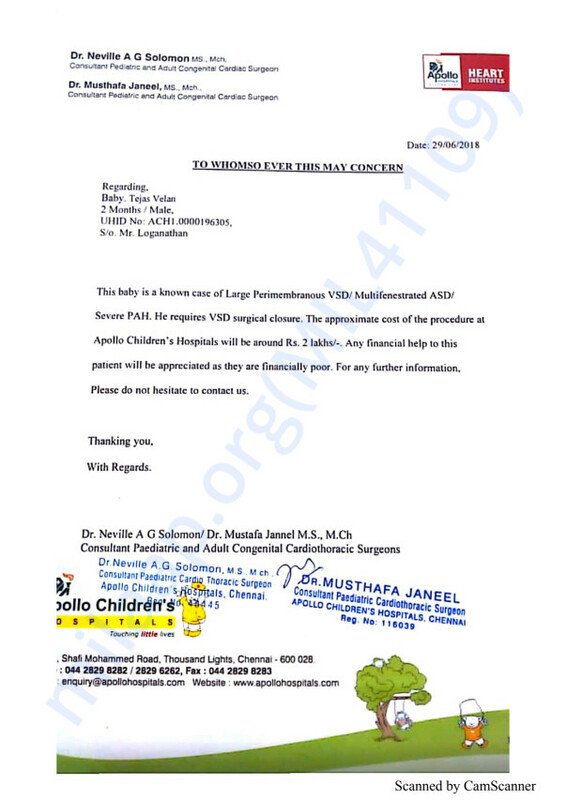 Unfortunately, the baby is diagnosed with a complicated heart disease, he has a hole between the heart's two upper chambers and in the lower chambers as well. As a result, some oxygen-rich blood is pumped to the lungs instead of out to the body. "He sweats so much while feeding, very soon he gets breathless. In this 2 months, he has not gained weight at all. Right from the day one, we are struggling to arrange funds for his surgery but we fail every day. I cannot explain how terrible it is to know that your baby is dying slowly and you're not able to do anything about it." - Srividya. 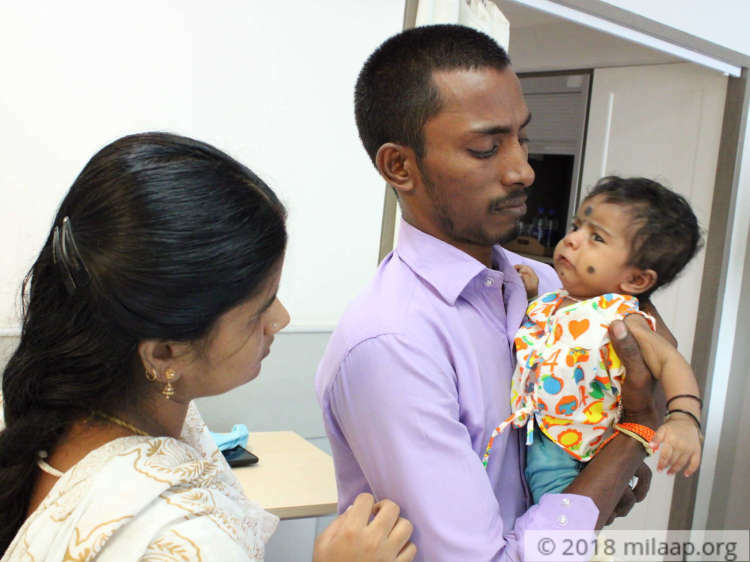 Though Loganathan and Srividya were shocked about their son's condition they were relieved that there is a solution to fight the disease. But now reality hits them hard and they are not able to make the money needed for the surgery. They have been spending the sleepless night since his birth and never been able to feel happy about being new parents. "He hardly sleeps in the night, he cries uncontrollably. He gets suffocated and we rush him to hospital. But doctors have clearly told us that nothing can help him but only an urgent surgery. We stay in the hospital the whole night and come back home after he sleeps." - Srividya. 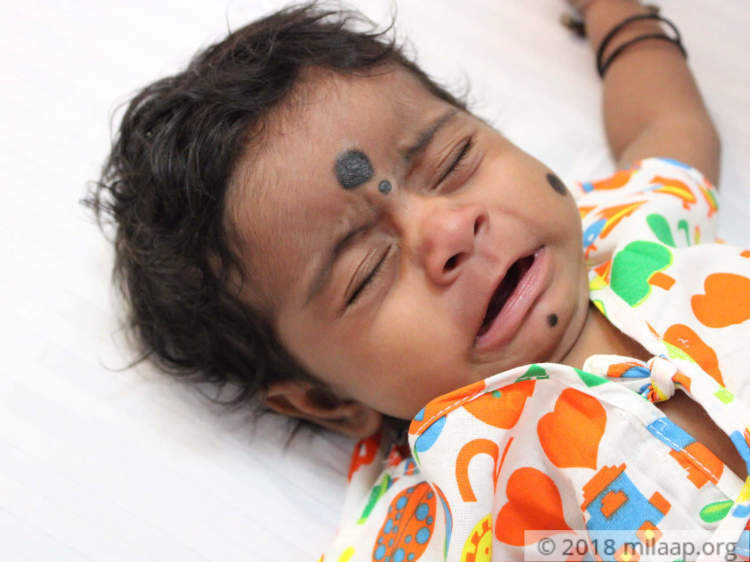 Srividya's baby needs an urgent surgery without which he will not survive. Even a small cold or an infection that might look harmless can turn fatal. The family has been extremely helpful to Loganathan and Srividya in this worst phase of their life by giving their moral support. However, they cannot contribute financially as they are poor too. "I'm an electrician and I do not get work every day; I earn around Rs 600 per day if I manage to find some work. My wife and I were always determined to give our child healthy food. We were willing to do anything for his future but now we are just watching him going through so much of pain. I do not have anything to sell, I know every passing minute is a risk I'm taking on his life but I'm helpless. I feel my guilt itself will break me into pieces." - Loganathan. 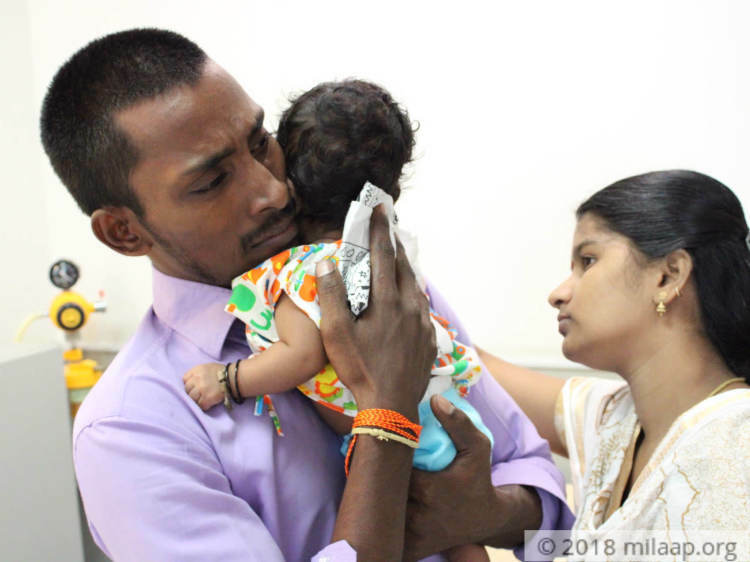 2-months-old baby Tejas is slowly succumbing to heart disease. It can turn fatal any moment without an urgent surgery. Loganathanan and Srividya have been struggling to arrange for the money since his birth but it seems almost impossible for them. They are struggling to even make their ends meet. 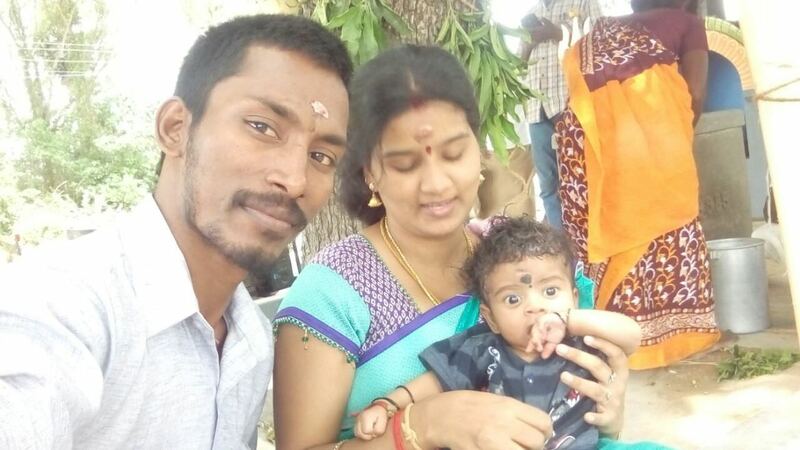 They need Rs 2 lakh to save their son's life. They are relying completely on crowdfunding to get the surgery done. Here is an image of Tejas with his parents. They are happy to have him back and they are grateful for the support you have shown. Thank you so much for the love and support you have shown towards Tejas. He successfully underwent the surgery and stayed in the hospital for one week so that doctors could monitor his health closely. Currently, he is at home and doing a lot better. He will have to visit the hospital once in three months for follow-ups. We are really grateful for all the support. Tejas is now getting better. He is likely to undergo surgery in about two weeks' time. He is currently at home and is on medication. We are all hopeful about his recovery and his response to the treatment. Please keep praying for him. Hope...and I pray he will come back.